Artist Code: 1405. SOLD. Original Oil on stretched canvas. Completed August 2014. Framed size 21” x 17”. Many thanks to Jan and Andy of Jandy Photography for letting me use their beautiful imagery – the second time I have used one of their excellent resource photographs for paintings. I had two frozen gannets which had been discarded by a taxidermist who retired and these were taking up much room in my special ‘animal freezer’. Someone offered me a road-kill mountain hare in its winter finery, so I had to paint the gannets picture and the frozen birds were then disposed of, thus making space for the hare (the subject of a future work). 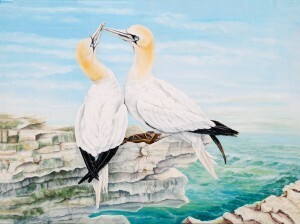 The sea and rocks are expressions of my imagination, but the birds are in an actual pose (very common when this species of bird is in breeding mode). For little ones, a tasty dish!